Tinnitus is a problem where patients perceive sounds in the absence of sound stimuli. It afflicts between 10-15% of adults, but can be a severe hindrance in about 2% of the population. While tinnitus is classically thought of as a ringing sensation in the ears, there’s a wide variance to what patients perceive. Some describe it as a hissing, sizzinling, whooshing, or clicking. The cause of tinnitus is known and well established in patients with hearing loss or those whose ears have been subject to noise trauma like loud music or blasts. However many patients experience tinnitus that can come out of the blue without a known cause. There is a growing amount of evidence that points to the neck as a unique source of ringing. 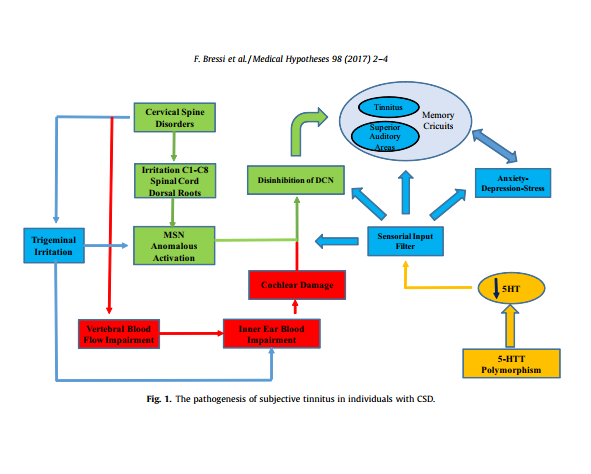 Some have identified this type of tinnitus as cervicogenic somatic tinnitus (CST) and is estimated to make up almost 40% of all tinnitus cases. How is My Hearing Related to My Neck? It seems strange that a problem in your neck can interfere with normal hearing, but researchers have been trying to identify why people with tinnitus can get improvement from things like chiropractic or physical therapy interventions. A study in the journal Medical Hypothesis looked at the neurological connections between the neck and the hearing organ of the ear. 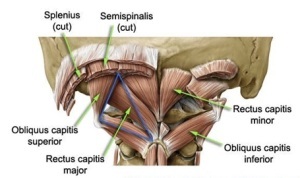 The authors showed that the nerve roots from all of the cervical spine all travel through the spinal cord and travel to the brainstem where your senses can integrate with some of the cells responsible for hearing. 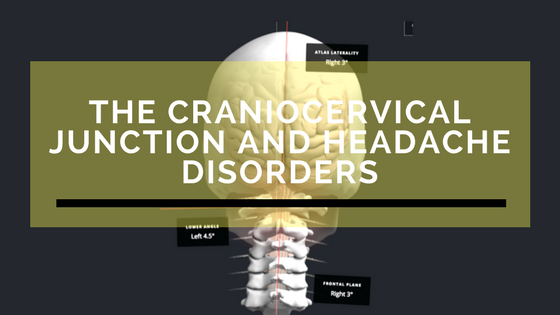 Cervical spine dysfunction has also been associated with blood flow problems, and some authors have hypothesized that dysfunction in the top vertebrae in the neck may affect blood flow to the brainstem and inner ear organs. When blood flow to these areas are compromised, then dysfunction from the ear can occur. 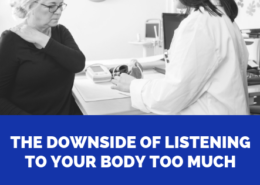 Problems like structural shifts in the neck or arthritis can agitate these sensory nerves and affect some of the brainstem regions that modulate your sense of hearing. 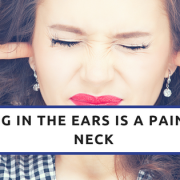 This may be the reason why some patients can have ringing in the ears that lingers after things like whiplash and head injuries in sports even when there’s been no damage to the ears. 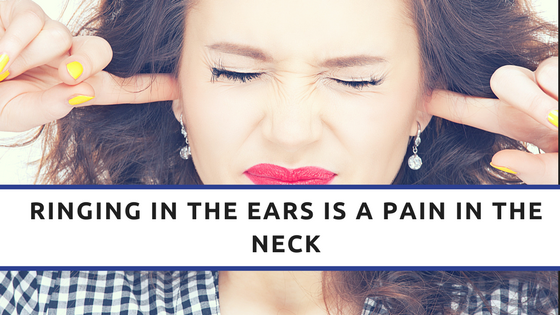 Fortunately for many, research is also showing that addressing the neck can improve tinnitus in patients with some of the most disabling symptoms. A 2016 study in the journal Manual Therapy showed that treating the neck can lead to substantial improvements in up to 53% of patients with severe tinnitus. Another study in 2018 showed that using both auditory and somatosensory stimulation can induce long lasting changes in the loudness and intrusiveness in tinnitus compared to just using one or the other. An interesting but little known fact is that chiropractic emerged in 1895 as a treatment for deafness. D.D. Palmer is credited with creating the chiropractic profession, and first performed an adjustment on a janitor with hearing loss named Harvey Lillard. It’s unclear what the circumstances of this first adjustment, but what is known is that Palmer thought he stumbled on the cure for deafness. It’s obvious that chiropractic is not a cure or treatment for hearing loss otherwise our offices would be filled with the deaf and hard of hearing. However, current neuroscience research has helped us understand how several patients with hearing disorders like tinnitus can get relief from a neck procedure like the Atlas correction. While it may not help every person with tinnitus, a thorough history and examination may be able to help us figure out if we can get that bothersome ringing out of your ears. 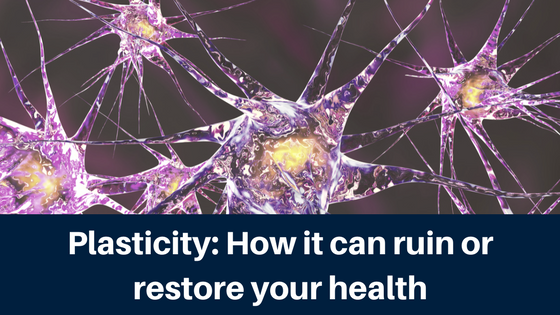 Homocysteine and Migraines – What Does It Mean? Headaches are very common and almost everyone has experienced one at one point in their life. They can be painful and disabling, which cuts into your focus, productivity, and quality of life. Headaches come in different types such as tension, cluster, and migraine. The migraine type headaches are the third most common disease in the world and effect about 14.7% of the worlds population. That’s around 1 in 7 people who will experience a debilitating headache that will put that person down for the count, locked up in a room with the lights off, and a trash can near by. It is not a pleasant way to spend your day. When you have a migraine you look for any way to get rid of them. People have asked what’s the relationship of homocysteine to migraines after hearing about methylation problems in the body. 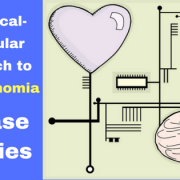 Homocysteine is an amino acid found in the blood, but if found in high amounts has been shown to cause inflammation leading to an increased chance of stroke or cardiovascular disease. Migraine headaches are severe throbbing or pounding headaches that usually occur on one side of the head. People may experience a sensitivity to light, sounds, and smells. Some experience nausea or vomiting. Some migraine patients experience what is called an aura before the onset. An aura is a visual disturbance, such as a blind spot or flashing light. 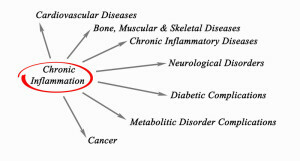 Homocysteines are a major player in chronic inflammation. 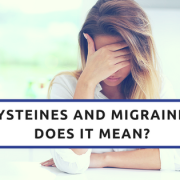 The question being studied is, “does an increase in homocysteine in the blood directly relate to an increase in migraines?” There have been a lot of studies to answer this question and the results appear to be conflicting. On one side, many studies show no significance between the two. 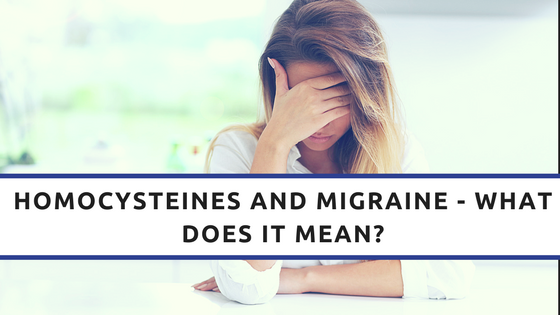 On the other side, some do show significance that an increase of homocysteine in the blood does correlate to an increase in migraine headaches. There seems to be no sound conclusion when it come to levels in the blood. 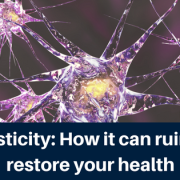 However, a study out of Headache tested homocysteine levels in the cerebrospinal fluid (CSF) in the spine and showed a very significant increase. It showed that migraine patients with auras had a 376% increase in the CSF and patients without had a 41% increase. What this means is an increase of inflammation in the CSF for people with migraines. CSF also acts an a cushion and protector of the nervous system. 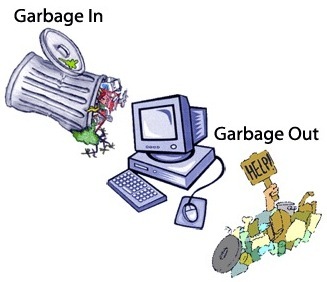 It should flow normally through out the system without being stagnant. 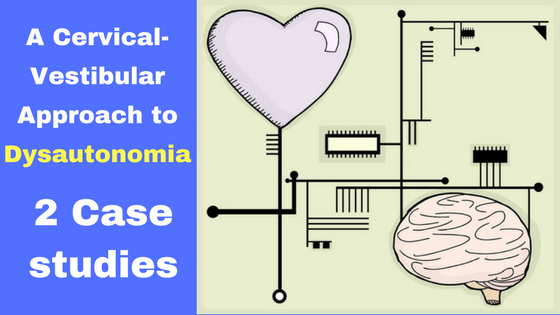 In recent years, CSF has been identified as a fluid that helps to remove waste products from the brain’s normal metabolism, and that failure in CSF movement from things like lack of sleep may contribute to the pathology of Alzheimer’s disease. Why Is CSF Important to Us? Sometimes when a segment in the spine shifts out of place it can not only put pressure on the disc, nerves, and bloods vessels around that segment, but it can also effect the flow of CSF through that area. When this happens this can cause CSF in areas in the head and spine to be stagnant because a segment has shifted out of place affecting the normal flow. When the CSF is stagnant you can have a pooling where it can collect homocysteine causing inflammation. 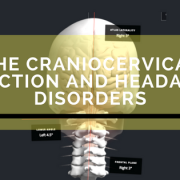 As a structural chiropractor that focuses on the craniocervical junction, the interaction between the neck and cerebrospinal fluid is an important area of interest. A study by the Upper Cervical Research Foundation showed that a correction of the atlas vertebra shows significant improvement in migraine symptoms and potential changes in venous drainage patterns. This allows things to function better, including the CSF to flow better. 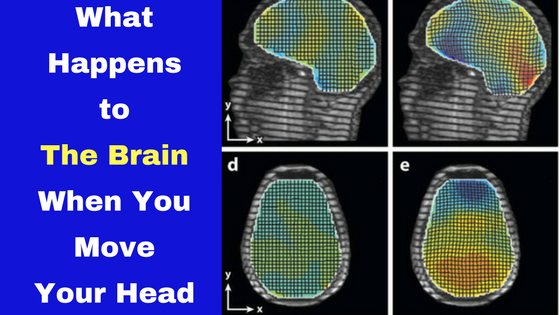 What Happens To Your Brain When You Move Your Head? A lot of you are familiar with my work on the relationship between the neck and concussions. It used to be something of a fringe concept that neck injuries could be related to some of the symptoms of a concussion, but research on the topic has exploded in the last 10 years. It’s not such a secret anymore. I’ll be honest. I didn’t understand a lot of what the paper discussed because it talked about the techniques they used to image the brain during movement. However, some of the videos they shared in the supplementary materials are stunning and really help us understand why concussions can happen with violent movement of the neck. 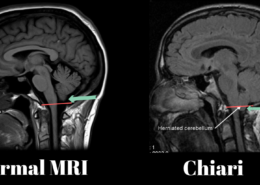 Let’s take a quick look at this gif of the brain on a tagged MRI. Movement of the brain with a simple head turn. That’s amazing! Look at that grayish stuff covered in a grid pattern. That stuff is the brain inside of a skull as the head turns normally. Does it remind you of anything? It reminds me of a plate of jello when you set it on a table for the first time. It gives us a good reminder of a couple of concepts. The brain isn’t a static structure. Normal head movement causes very conspicuous movement of your brain even with the surrounding barrier of cerebral spinal fluid. You can take a look at some videos taken directly from the study at the end of this article. If the Brain Moves with Normal Head Motion, What Happens When I Really Hit My Head? So the whole purpose of this study is to get an idea on how the brain may be moving when exposed to head trauma. 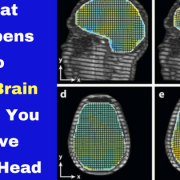 If just normal movement of the head is creating substantial brain movement, then we can begin to imagine what happens when someone takes a hard blow to the head. 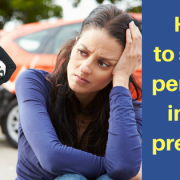 Many people associate a concussion with a contusion-type of a trauma….like a bruise. However, some of the hardest hit parts of the brain from a concussion are not the part of the brain that hit the skull. Many times, the most compromised structures from a concussion are some of the midline parts of the brain like the midbrain and brainstem. 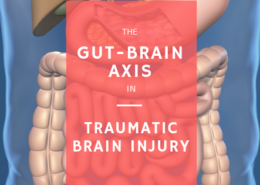 This is because that soft gelatinous tissue will experience a SHEAR type of strain from the way the brain moves! Even forces below the threshold usually required to cause a concussion may be creating excessive movement of the brain and injuring some of the delicate wiring that allows our minds to work. That means that hits to the head, or really rapid head accelerations from things like whiplash may be creating damage to the brain even in the absence of a full blow concussion. Why? 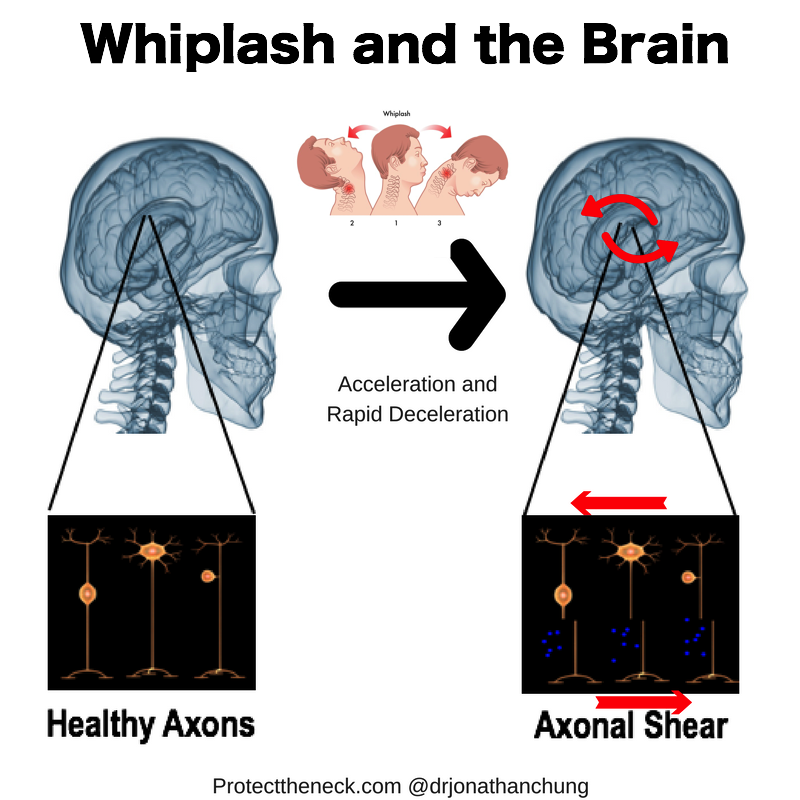 Because whiplash injuries are known to create shear forces into the spine, but the brain can also experience some of this as well, but likely at a much smaller amount than a full blown concussion. 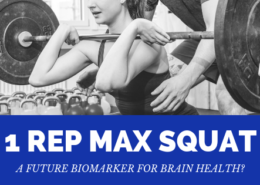 Knowing how the brain moves when the head moves does help to explain why youth and high school athletes can show signs of brain changes in a season of football even without a concussion [1,2]. It can also help explain why some NFL players can have a degenerative brain disease like CTE even if they had no history of a reported concussion. This is also the reason why that helmets probably aren’t enough to make contact sports safe for athletes long term. You can stop the head from hitting the ground with a helmet, but you can’t stop the brain from sloshing around and deforming when the helmet gets hit. We can’t fully prevent head injuries from happening to people, but the more that we know about how the brain moves when you move, the more we can do to help make sports and life safer for everyone. This not only robs patients of benefits that may provide them with appropriate care from other providers, but it also causes take money out of the pocket of consumers as insurance premiums rise to pay for these unethical practices. On top of that, dizziness means something different to different people. 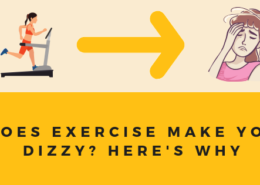 Does your dizziness feel like spinning? Rocking? Feeling off balance? Light headedness? Sometimes the feeling of dizziness can be hard to describe because you just feel disoriented and lost in space. All of these factors are important to help a doctor get the right diagnosis. 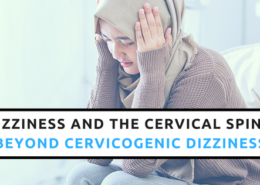 It means that a doctor has to take a good health history, perform the right bedside tests, and order the appropriate diagnostic testing to find out the cause of your dizziness. Without knowing what’s causing this feeling, then administering the right treatment can be a lucky guess at best, or make you more dizzy at worst. It’s no wonder that people who have chronic vertigo and other balance issues often see their primary care doctor, neurologist, ENT, physical therapist, acupuncturist, and more looking for answers on how to get their world to stop moving. Another challenge with dizziness patients is that medications don’t really do a good job of making the world stop moving. Many patients with chronic dizziness are placed on anti-depressants, anti-anxiety meds, and drugs for nausea. The problem with that is that the patient may not be as nauseated, but their brains are not responding to their environment appropriately. Dizziness after spinning on a bat is easy to explain, but what if the world is spinning when you’re standing still? Dizziness can also be treated by positional maneuvers like the Epley maneuver and head shaking exercises like gaze stability. Both are extremely effective when they are used appropriately, but can be useless if it’s performed on the wrong patient with the wrong diagnosis. That’s why it’s so important to know what’s really going on with a patient. Many clinics will take any person with dizziness and just do some of these maneuvers even though the maneuvers may not be appropriate for the patient’s specific condition. In order to help a patient recover, we have to examine them closely to make sure that we have the right information to begin care. Recently we had a patient come in with dizziness and had been seeing an ENT for treatment. She was having problems feeling off balance for a while and it was made with head turning sometimes. She wasn’t experiencing a spinning type sensation, but just a sense of feeling out of sorts. The doctor diagnosed her with benign paroxysmal positional vertigo or BPPV. It’s arguably the most common form of vertigo and is usually easily treated with a positional maneuver called the Epley maneuver. The doctor performed Epley and gave her some alternative maneuvers that she could do at home whenever she felt dizzy. The problem was that the maneuver wasn’t changing anything. She tried doing the maneuvers for several weeks with no change. When she followed up with the doctor, the doctor told her there wasn’t anything else he could do and that some cases don’t respond. BPPV usually causes a spinning sensation that is really short lived. In many cases, doctors can diagnose BPPV with a test called the Dix-Halpike maneuver. You can look at this test below. If you have BPPV your eyes will start moving making a fast oscillating movement called nystagmus. It’s this nystagmus when the inner ear moves the eyes that creates a feeling of spinning. When this patient came in, we did a thorough history and found out that her “vertigo” didn’t have any spinning at all. She just felt disoriented and off balance. We performed the Dix-Halpike test and she had her eyes stayed solid. So now we knew that she probably didn’t have BPPV, and that’s why the Epley maneuver didn’t work that well for her. It was time to figure out what other anatomy might be causing her problem. We did a test called the smooth pursuit neck torsion test. 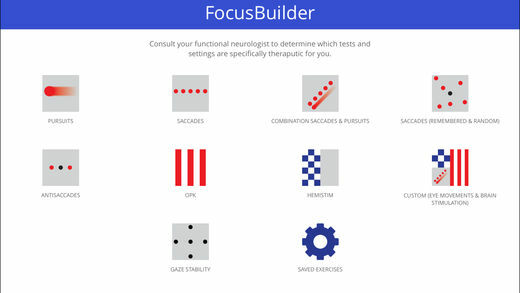 It’s a test developed from patients who had dizziness after whiplash. It’s an indicator that the neck might be causing the eyes to move abnormally. You can see that test here below. In patients with neck problems, the eyes will start jumping instead of staying smooth. Now that we knew the neck could be a problem, we started addressing the neck using the NUCCA procedure for structural correction. Within 2 visits, the patient’s dizziness was about 80% gone. We have more work to do to help the neck heal, but with some time I think this patient will get back to normal. So this isn’t an indictment on another professional. Lots of ENTs keep their focus on infections of the ear, nose, and throat. An ENT with a neurology background would probably have found the same thing and recommended physical therapy or chiropractic care. The lesson here is that dizziness is complicated, and one treatment won’t solve all forms of dizziness. For any condition, we have to spend time with our patient, listen to their history, examine them thoroughly, and we can find a game plan to help them get back to normal. In my 7 years of practice, I’ve had the honor of taking care of many of you when you have suffered from a variety of terrible health conditions. Thank you for putting your trust in myself and my staff. Don’t worry, this isn’t a farewell letter. I’m not going anywhere anytime soon. This is a letter to let you know that for all the trust you have placed in me to take care of you, I don’t think I was serving you to the very best of my abilities. Don’t worry, it’s not because of a lack of training or ability to give a great atlas correction. I will always stand by my work there. It’s because until recently, I don’t think I was able to truly understand what many of you have felt on a daily basis. 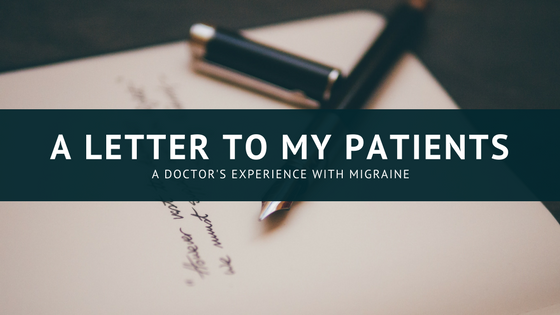 It wasn’t until I got a taste of the throbbing pain and the nauseating sickness of a migraine that I could feel a deeper sense of connection to what some of you have felt for years. Throughout my life I’ve always been fairly healthy. I’ve had some of the headaches, stomach aches, and shoulder injuries but these problems came and went without much assistance from other doctors. Even my introduction into chiropractic was less about treating any pain or symptoms, it was really about correcting the structure of my spine so I could experience what it was like to have optimal structure and better health. Last month I got sick for the first time in several years. I can’t even tell you the last time I had a cold. I got hit with a terrible fever for 24 hours after a light workout. I came home to a feeling of chills followed by a long night of sweats and a 103.5 degree fever. After a restless night of sleep, I noticed that I still didn’t feel quite right. I went into the office the next day in a daze that I couldn’t shake. That afternoon, the headache hit. My head started pounding and just the normal light and sounds of the office seemed to overwhelm my senses. I was nauseated and the only thing that seemed to be less terrible was just to put my head down and close my eyes. I made it back home and just lied down in the dark. I didn’t want anything to drink, and I didn’t want any dinner (which if you know me, then you know this has to mean that I was in bad shape). It was too late to see my chiropractor, and anti-inflammatories didn’t really budge the pain. All I could do was close my eyes, endure, and wake up tomorrow with the hope for a better day. The next day I got to wake up feeling a little hung over, but after getting an adjustment from my chiropractor I bounced back to my normal self pretty quickly. A lot of people don’t get to have that luxury, and I feel for them. I’ve always known intellectually that living with chronic pain and illness must be a terribly difficult existence. However, it’s difficult to feel that struggle until you’ve experienced a taste of it for yourself. I will always strive to improve my skills as a clinician to deliver the best care I possibly can to my patients. And even though I’ve often praised for my bedside manner, I think this short but temporary bout with the debilitating feeling of a migraine will make me a better and more compassionate doctor for you all.